Get a quick overview of your assembly components with the Analyze tool in Glovius. Use the Analyze tool in Glovius to view key information about a selected component. Glovius shows the extent dimensions, mass, surface area, volume and center of gravity. It also shows the numbers of instances of the component in an assembly.This tool helps in quickly estimating the material required and cost of manufacturing the component. This is useful for quickly preparing quotations. Watch the video below to get going. 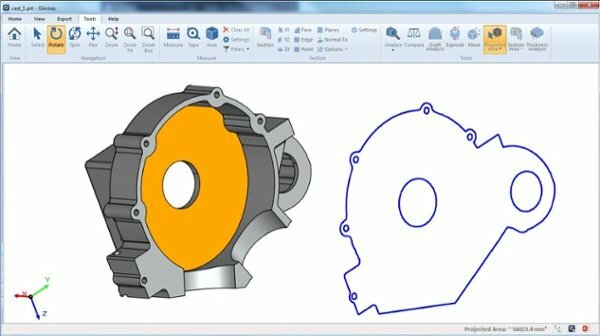 Understanding material distribution is crucial for design and manufacture of casting parts. Use the thickness analysis tool in Glovius to quickly determine material distribution. See a short video below to know more. Measure the draft angle for parts along a separation plane. 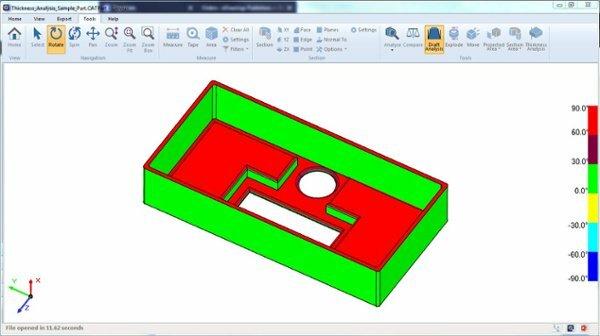 View the projected area of a component over a directional plane.